Find authentic Sharingan contact lenses online to create the perfect anime character Kakashi look. If you've never heard of Kakashi, Obito or Team 7, then you won't have a clue what the Sharingan is. But if you have and you want to look like your favorite anime character at this year's Halloween party, then you've come to the right place. Anime characters offer a fun way to dress up during the holiday season and what better way to make your outfit look totally authentic than to pop in a pair of anime contacts, novelty colored contact lenses that transform your eyes from your natural eye color to whatever design is on the crazy anime lens. 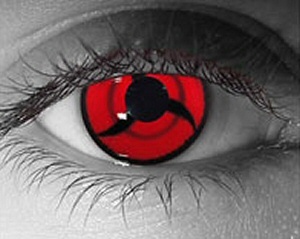 Sharingan contacts are highly popular and are a red contact lens with 3 black blades emanating from the center of the lens. They also double quite nicely as vampire contact lenses! Looking for true-to-life Sharingan Contacts? These dramatic red lenses with the distinctive 3 blades on a deep red background are quality theatrical lenses with a 15.0 diameter. Available as both prescription lenses in powers from +4.00 to -6.00, they come in 2 different base curves of 8.4 and 8.6 and are custom made to order, so take 4-6 weeks to deliver. While they are more expensive than other novelty lenses commonly worn for special occasions like Halloween, our trusted theatrical lens supplier is currently offering 25% discount to all new customers reducing the price from $104.99 to $78.74 per lens. Just use coupon code NEW25VISION at the check-out. I probably sound like a worn record, but it's really important to only buy crazy colored contacts from reputable optical retailers rather than sites purely set up to sell fashion contacts for cosmetic purposes. The latter are rarely approved by the FDA as having safe lenses made from quality materials that won't harm your delicate eyes. Tip: Beware of websites, often based in the Far East, selling cheap cosmetic Sharingan contact lenses for as little as $25 per pair. They are usually advertised as one year lenses that can be worn for up to 8 hours. In practice, your eyes will be very sore after a couple of hours as the thick cheap plastic won't let your eyes breathe - not much good for a late night party!